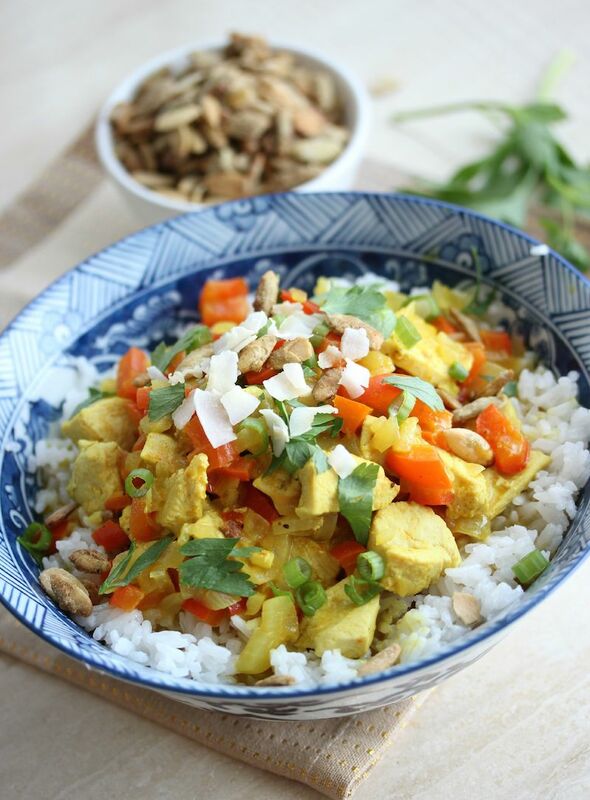 Chicken and vegetables tossed in a rich, creamy pumpkin coconut curry sauce served over a bed of Jasmine rice. A complete meal ready in 30 minutes! Pumpkin season has ensued, my friends. Though in all honesty, pumpkin knows no season in my kitchen. I just can’t limit pumpkin pancakes and waffles to only one season. It just seems criminal to deprive myself of such deliciousness because there isn’t a crisp fall breeze in the air. Yanno?? Especially considering the fact that Florida likes to give us 10 months of summer, 2 weeks of fall, 1 month of “winter” and then 2 weeks of spring. I’m literally sweating while typing this. But back to this dinner that I want to eat all over again. Seriously, how faceplant worthy is this bowl? The ONLY thing it was missing was a side of warm garlic naan to soak up the extra sauce. Mmmm. Curry dishes are always my favorite to order at Indian restaurants. There is just something so satisfying about the aromatic flavor of curry. Not to mention the beautiful vibrant color. So enticing! 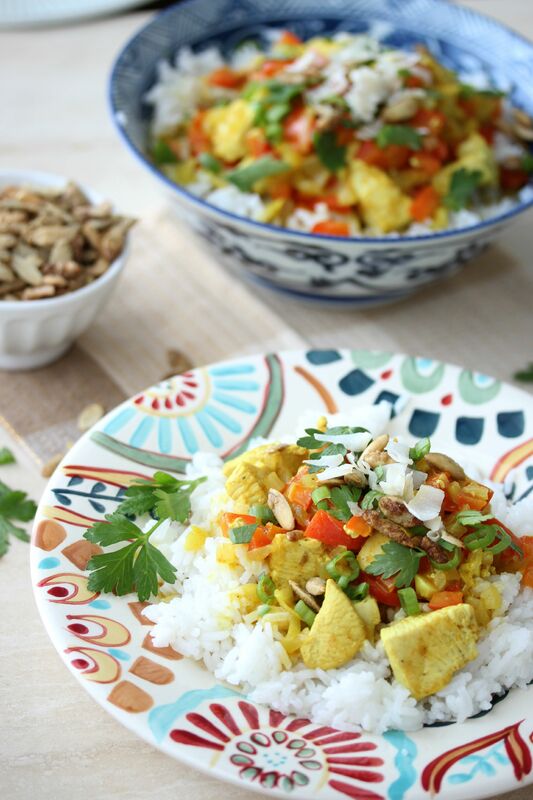 The one down side is that curry dishes typically are not the lightest options on the menu, but luckily there are ways to lighten them up at home without skimping on flavor. In terms of heat, this dish would be considered mild, though if you want to add a little spice, crushed red pepper or red chili paste would do the job deliciously. This is the perfect weeknight meal to have for dinner and take for lunch the next day. Especially since it almost tastes even better the next day after the flavors have had extra time to marry. It requires little prep work and very little fuss. Winning combo! Warm, comforting and curr-azy delicious! 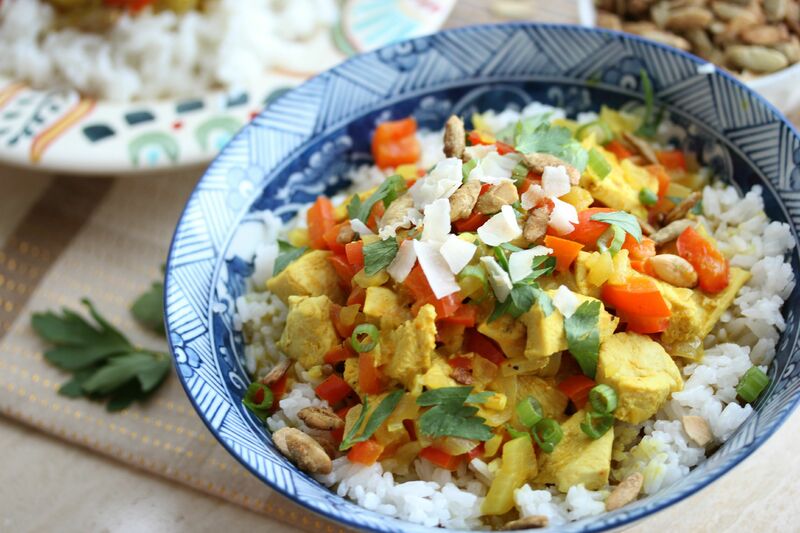 Chicken and vegetables are tossed in a rich, creamy pumpkin coconut curry sauce and served over a bed of rice. A complete meal ready in 30 minutes! Prepare rice according to instructions. Jasmine rice takes roughly 15-20 minutes to cook. Set aside. In the meantime, heat oil in a large skillet over medium heat. Add peppers and onions and season with salt & pepper. Saute for 7-8 minutes, adding the garlic in the last 2 minutes. Transfer cooked vegetables to a plate. Add chicken to the heated skillet and cook for ~3-4 minutes, until no longer pink. Add vegetables back to the skillet. In a medium-sized bowl, combine pumpkin puree, coconut milk, chicken broth and spices (curry powder, coriander and ginger). Whisk to combine. Pour sauce in the skillet and evenly coat chicken and vegetables. Turn heat to high and bring contents to a boil. Reduce heat to low and simmer for 10 minutes, until chicken is cooked through and sauce slightly thickens. To assemble: add rice to a bowl or shallow plate. Spoon curry mixture on top of rice, adding enough sauce to thoroughly coat the rice. Top with parsley, green onions, pepitas and coconut. Serve!